“On an operational level we were able to increase sales by five percent. While sales prices generally remained stable, we achieved new record levels in our sales volumes,” said Dr. Michael Schwarzkopf, Chairman of the Executive Board of the Plansee Group at the annual press conference in Reutte, Austria. More than half of Group sales were achieved in the three sectors of mechanical engineering, automotive and consumer electronics. “We were surprised by the demand from the automotive and aerospace industries in Europe,” said Schwarzkopf. In Asia, the Plansee Group gained market share with products for the consumer electronics industry. In terms of the regions, sales remained stable compared with the previous year (Europe 49 percent, America 28 percent, and Asia 23 percent). For the first time, 34 percent of sales were realized with products that are less than five years old. “This is the result of our sustainable investments in Research & Development,” said Schwarzkopf. On a Group-wide level, more than 60 million euros (five percent of sales) were invested in innovation projects over 2014/15. With the recently announced acquisition of the Finnish company Tikomet Oy the Plansee Group division GTP strengthened its product portfolio for recycled tungsten powders. Tikomet, located in Jyväskylä, has 40 employees and is one of the leading producers of zinc reclaimed hard metal powders. Both acquisitions underpin the strategy of the Plansee Group to assume a leading position in the high-tech materials molybdenum and tungsten, from ore concentrate processing to customer-specific components. During the last fiscal year, the Plansee Group made investments of more than 180 million euros. These included acquisitions, new production plants in India and South Korea, investments in increased production capacities in Austria and Luxembourg and expenditure for product and process innovations. Due to its solid earnings, Plansee was able to further strengthen its equity capital. “An equity capital of well over 1.1 billion euros enables us to face with confidence the challenges of an economic future that is difficult to predict,” Schwarzkopf said. 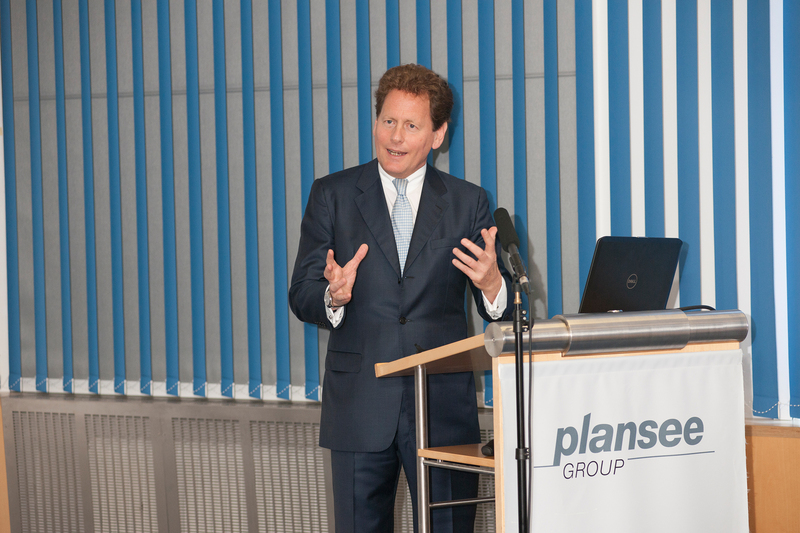 Over the past ten years, the Plansee Group has significantly expanded its industrial portfolio. A decade ago all Group activities generated total sales of 900 million euros; in the last fiscal year this figure increased to 2.4 billion euros. On a worldwide basis, all associated companies employed 11,800 staff; 400 more than the previous year. In Austria, the headcount increased by 100 to 2,300 employees.